This article instructs how to enroll an Android device to Miradore Online before you know who will be using the device, or in case the device is intended for shared use. 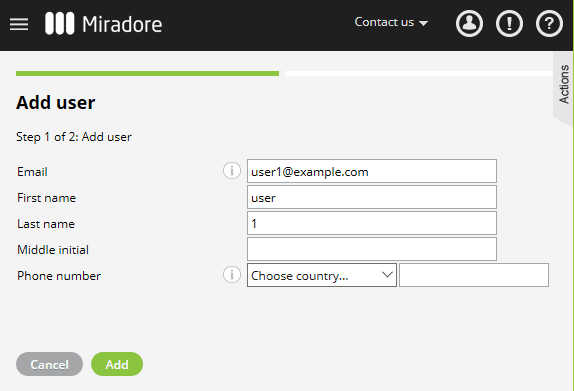 Before enrolling a device, add a new generic user to Miradore Online for the device that you're going to enroll. The name and the email of the user can both be imaginary. More instructions for adding users. You can find a detailed description of Device Owner mode and further instructions for these device provisioning methods from How to enroll work managed devices article. After you have enrolled the device in Miradore Online, navigate to Devices view. Open the device page and set the generic user account as the user of the device if it's not set already. Make sure that you can assign only 10 devices for each (generic) user account. 10 devices per user is the requirement by Google. On the device's Action log, you should soon see Create managed Google Play Account action in completed status. When you learn who will be the actual user of a device, go to the Users view and edit the details of the device's generic user. Replace the generic name with the real user's name etc. You may also assign a Mail for Exchange account to the user on the Mail for Exchange accounts tab.